Missed the last round of Content Management training, need a refresher course, or do you just want to get in on the awesome Web Content Managment for CFCC.edu action? Well you are in luck. New WordPress training sessions will be available for Mondays and Thursdays from 10am to 12pm for the month of May. Space is limited so pick a session and sign up today! The new CFCC.edu website will launch very soon and the migration of department and program websites to the new template will begin. This means it’s time to learn all about WordPress. WordPress is the content management system used to create, edit, and maintain content on the new website. Training tutorials will be offered starting February 4th in the TTC (L210 in the Library Downtown.). These sessions are open to all. However, if you currently use Adobe Contribute to create web content for CFCC.edu it is highly recommended that attend one of the training sessions. Sign up by registering for one of the four training sessions below. If you do not currently work with web content for your program or department and want to learn how, then sign up! The are 15 seats available for each session. Thank you for your interest but all sessions are FULL! More training sessions will be scheduled. Stay tuned to Cape Fear All emails and to the IT Update Blog for future information from the web team. View / Download the WordPress 101 Tutorial. CFCC Redesign offers a fresh, new look. Beginning in late January CFCC’s public-facing website CFCC.edu will have a brand new look! The new website has been developed in tandem with the current website and features a new responsive web site design that will adapt the page layout and content to the size of the user’s display or device. This will improve the accessibility of contentÂ on CFCC.edu for mobile devices, tablets, and traditional desktop computers. The new website is operational and available for review at http://www2.cfcc.edu. Furthermore, the new website has been built and developed on the WordPress Content Management System. This will usher in a new era of web content management and generation allowing in-browser editing from any PC for authorized users and eliminate the necessity of purchasing Adobe Contribute to maintain the website. CFCC has used WordPress as a content management system for several years: the CFCC News Feed, the Foundation, and the Hanover Art Gallery all use WordPress to create and maintain web content for the college. Some departments and sub-sites have already begun using the new website. This includes the Vocational Department, Student Clubs and Activities, and the new Faculty Association website. Several other departments have migrated and will launch soon. In late January the CFCC home page will migrate to the new look and feel along with several general information pages that are maintained by the web team. For a short while the New and Old websites will exist in tandem and careful cross linking will allow site visitors to access all current website content. The CFCC public-facing website is a massive site with numerous content editors and this requires a phased approach to migration. As the Spring 2013 semester progresses the web team will approach (and work closely with) departments to migrate their content to the new look and feel as seamlessly as possible. This is an opportunity for all departments to examine their current websites, review content and form new strategies for web assets. Some changes will be slight, others may be drastic. Regardless, the Web Team will assist and support every step of the way. In addition to migrating, content tutorials and training will be offered to all current web editors and contributors to allow them to become familiar with the new website and its internal workings. Training will be offered via online tutorials, workshops in the TTC, and one-on-one training on an as-needed basis. More information on training and tutorials will be available soon. It is important to note that the current method of creating and editing content will remain in place until the web team works specifically with a department to migrate to the new site. Departments who do not currently maintain their own content will also be notified ahead of time prior to any migration of their web content. Your website will not be changed without notification or your involvement. Migration to the new site is mandatory. Out with the old in with the new! What is changing. The public-facing website will no longer require the purchase and installation of Adobe Contribute to access and edit pages. The new website will have a fresh new look and a responsive layout providing solid user experience on tablets and mobile devices. Current sub-sites with custom designed templates will temporarily use the standard CFCC template until site migration is complete. WordPress is a Content Management System. (CMS) A web-based program that stores, manages and displays web content. Website content creators use a web-based dashboard to create, edit and maintain text, images and media in various pages and posts. Potentially any CFCC employee can be given some level of permissions to access, create and edit content for the website. 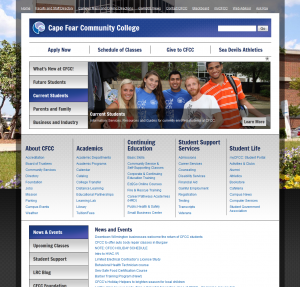 The content an employee can access has alot to do with the organization of the CFCC.edu website. The previous CFCC.edu website was a large static site made of numerous directories and thousands of individual files that formed the siteâ€™s pages and content. Access is granted using a third party software and users are restricted to pages within the directory where their website resides. The new CFCC.edu website is actually a network of micro-sites bound by a common design theme and a universal navigation structure. Each Academic or Administrative department will be its own site in the network of CFCC websites. Consequently, each department can assign their own site administrator and users that can only access and edit the content of their specific site. Overall cohesion, site-wide navigation, and look and feel will be managed through the use of themes and plugins that are centrally controlled by the CFCC Web Team. The new home page will launch in late January. Training and tutorials will be ready by launch in late January. The web team will approach departments to migrate sites throughout the Spring 2013 semester. Even as the new site begins to take shape features and content will be revised and improved. Constant and evolutionary changes to cfcc.edu are to be expected.